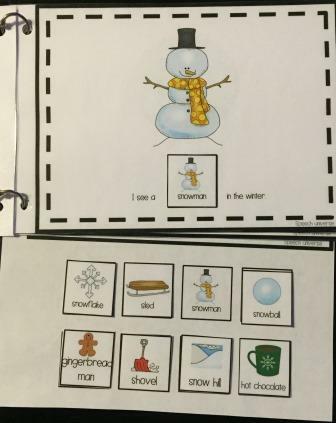 I have been using interactive books like these for years. My ASD team purchased a few of the Pyramid Educational Consultants books back when I started in the ASD realm. I can't even find the books that I have for sale anywhere now. After we started using these, I realized that I wanted to make my own. This was way before I really knew how to create products, and I think I created it in Microsoft Word. For my friends who make products, you will understand that it took a LONG time to create this original product. I have a really hard time formatting anything in Word. It is just hard for me to get things to go where I want them to. Anyway, back to my original books. I made several winter themed books about what we do in winter vs. summer and also what do we wear in winter vs. summer. These books were a big hit, and I used them for years. Fast forward to now...I have so many students who are struggling with sentence expansion, vocabulary, and answering simple questions. I wanted to update my books (they were looking a little old, tattered, and dated) for use with a variety of my students. The first two that I have made are: Winter Activities and Winter Clothes. 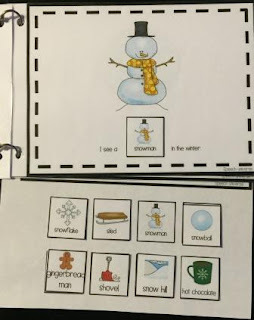 Both of these books have already been big hits with my students with ASD (and their teachers) as well as some of my students in Kindergarten and First Grade who are working on some different language skills such as answering questions and expanding utterance length. •Print and laminate all pages. •Cut the top half of the book pages. Leave the last page whole (this is where you will store your interactive pieces. •Hole punch all pages within the black box. I use two holes. Then, place the book pages on top of The last page. Bind the book using book rings. Another option would be to bind the book with a binding machine. •Cut out the interactive pieces. 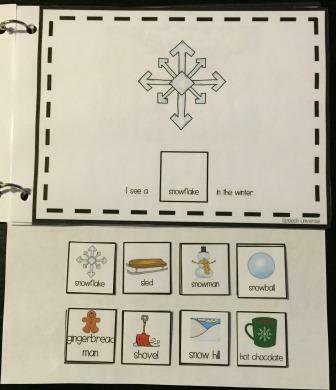 •Place a piece of hook Velcro on each sentence square on each book page, as well as on top of each square picture on the last page. Place a piece of loop Velcro on the back of each interactive piece. Store these pieces on the last page. 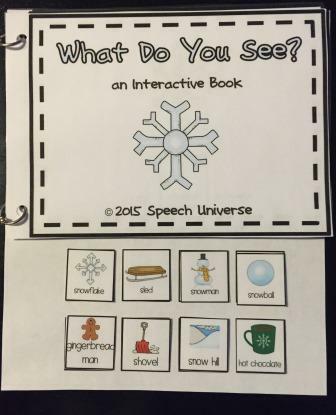 •Students will read the book, and move the interactive pieces to the sentence box for each page. You can find these books at my TpT store HERE. There will be more to come! I already have my summer ones completed, just haven't totally tested them out yet. I'll keep you updated as more of these come out. ***Updated Winter 2015!!! I have added an additional book to this set. What Do You See? is the latest book. My students did really well using the spring, summer, and fall versions of this, so I went back and added the What Do You See? for winter. Hopefully you and your students enjoy these as much as we have! Very cute Jen! I love them! I love interactive books, too and like you have been making them for many years! It has just become so much easier with improved technology. I still have all my originals created with boardmaker and some with cut and paste!! Great post! Thanks. 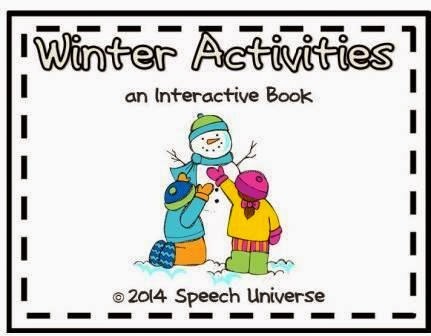 I'm looking forward to purchasing your winter themed books! Do you have an option to download this book? How do you get a copy of the book?